Not a great picture perhaps but I bet it was a rivetting duel to watch. Hello Stuart! :) How exciting! A great way to see a lifer too. I clicked twice on your photo, and it really is quite a good capture. I wish that I had taken it! A skua of any version is always exciting to watch. After all. they are just marine raptors with all the tricks of the trade. I remember getting dive bombed by Great Square in the Orkneys. Good job I wasn't carrying any fish with me. I think it's a great picture and a fantastic sight to have seen. 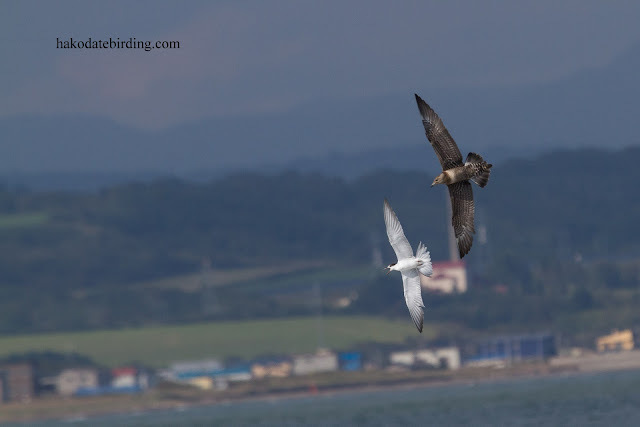 Great photo of the skua mugging...they're pretty swift ! Thanks John, it must be great this season offshore.